As expected, Spanish PM Mariano Rajoy suspended Catalan self-governance after a Saturday morning cabinet meeting. Ahead of Saturday’s action, a regime spokesman lied, claiming Catalan autonomy won’t be suspended. 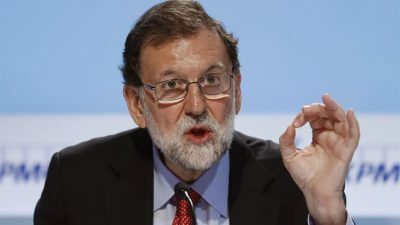 Its officials will be replaced by Madrid “administrators,” its powers stripped once Rajoy’s-controlled Senate ratifies his diktat next week – despotically usurping power over Catalan self-governance. He called for snap elections “in a maximum of six months.” President Puigdemont alone has this authority, stripped from him once Madrid’s Senate acts. “The Catalan self-rule is not suspended, but its legality is being restored” – by despotically replacing it with Madrid rule until snap elections install regime puppet governance to do its bidding. Measures to be imposed also apply to Catalan parliamentarians, its legislative powers stripped. Puigdemont is expected to address the rally. Earlier he vowed to formally declare independence if Madrid imposed rule over the region. Spain’s opposition PODEMOS party called for Rajoy’s ouster. Spaniards are ill-served by his repressive government.